A perfect soup recipe is one you make forever--it is comforting, nourishing, the very essence of flavor. 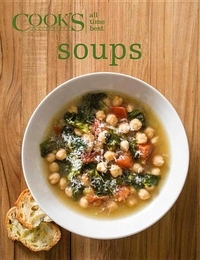 In this handsome, focused cookbook, the experts at Cooks Illustrated boil the world of soups down to the very best choices, each one a kitchen-tested keeper yielding flavors that exceed even what grandma cooked up. Here are the ideal broths, the heartiest rustic soups, most elegant purees, and the best examples from around the world. All-Time Best Soups turns soup-making into an everyday pleasure with recipes guaranteed to become cherished favorites.